Congratulations to Eric Graham, Groundskeeper and Mel Lee, Assistant Athletic Director, Head Softball Coach, and Instructor for receiving the October Auggie Pride Award. 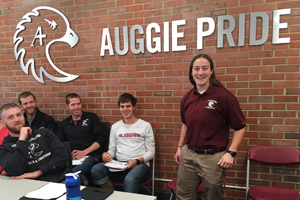 Their hard work in their new roles here at Augsburg made a huge impact across campus. Staff Senate admires the work they do everyday and are honored to award them both with this month’s Auggie Pride Award. Congratulations Eric for receiving the October Auggie Pride Award. Nomination: It’s better to just go out and walk around campus on a sunny day to get a full appreciation of how one man—a new addition to the Facilities Management Team—can make a significant change to the Augsburg environment. And he did things the right way. Going from one end of campus to the other in a calculated manner, pulling weeds, adding plants where needed, edging beds, and addressing every detail. For example, his work in the quad involved moving the inappropriately placed shade-loving hosta and adding turf. To do so required removing the large roots and leveling the ground. The quad now looks like a quad should, and Eric mows it to add pattern, which gives a lovely look from ground level and particularly higher. Today I parked for the first time in months in Lot L and noticed the plantings around benches in front of Si Melby. If I were a parent dropping my child off for college today, I would believe that Augsburg was a beautiful campus where care is taken. And that is solely the doing of Eric and his team. Congratulations Mel for receiving the October Auggie Pride Award. Nomination: Melissa has been working tirelessly this year thus far averaging 14 hour work days 7 days per week. She has been doing her class load, helping students with class advising not to mention her Head Softball coaching duties and Game Management duties. 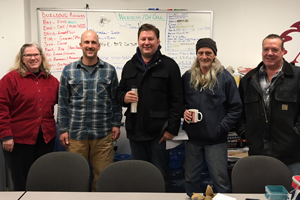 She even took time out of her busy schedule to help the Excel Energy employee find the gas meter at the Kennedy Center and covered a shift for a colleague who needed to be gone due to a family funeral. Melissa has the desire to give and help others in any way possible. She exemplifies what it means to be an Auggie! !